Turn your travel from Barcelona to Seville into reality with our tickets AVE Barcelona - Seville. Between 8:30 h and 16:32 h we are introduced to the daily offers for travelling by AVE between Barcelona and Seville, in the first case, we leave from Barcelona towards Sevilla Santa Justa, we arrive at this station at 14:02 h, and in the second case, also from Barcelona heading Sevilla Santa Justa, where we arrive at 21:45 h. Use our search engine to get tickets AVE Barcelona Seville at the best price. Equally, for the return, AVE Seville Barcelona. What is the best time for departure from Barcelona to Seville? In terms of duration of travel by AVE, the most appropriate is leaving at 16:32 h, because it will advance in the minimum time possible the route Barcelona - Seville, 5 hours 13 minutes, and we are going to be in Seville at 21:45 h, however, leaving at 8:30 h means the maximum travelling time, 5 hours 32 minutes, arriving at Sevilla Santa Justa at 14:02 h. Travelling is one of the most popular hobbies of people, make it cheap with our tickets AVE Barcelona Seville. The timetables for AVE from Barcelona to Seville on AVE schedules Barcelona to Seville. 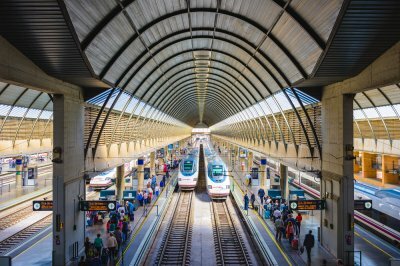 The search for the AVE train ticket from Barcelona to Seville for the best price was made on the 20/03/2019 a las 20:12 h, it is a AVE train with departure on the 23/03/2019 a las 15:50 h and arrival on the 23/03/2019 a las 21:20 h. The price of the cheapest ticket has been 35,35 € and the cheapest rate possible for this ticket has been the Promo fare. Trenes.com issues official AVE Barcelona Seville tickets and it does totally legally as a verified and authorised travel agency by Renfe, ie if you buy a AVE Barcelona Seville ticket through our website, you only need to print the ticket or to show the bidi code sent to the mobile phone, present it at the Barcelona Sants station and get on the train you have got assigned. 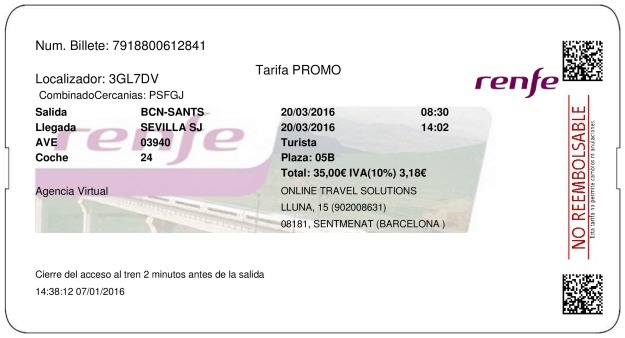 This is a real example of a Barcelona Seville ticket issued by Trenes.com. On it you can see the ticket number 7918800612841, the locator 3GL7DV, the origin and destination stations, in this case the train travels from Barcelona Sants to Sevilla Santa Justa. The railway operator Renfe, the train type AVE, the train number 03940 and the rail car 024. The contracted rate Promo in Turista class, the assigned seat 05B, the price for the ticket, this Barcelona Seville train ticket is not necessarily the cheapest ticket since the price of the train ticket often depends on the time in advance with which you bought the ticket. In this case the price is 35,00€ and the departure date is 20/03/2016. The train departure time of this ticket is at 08:30 h and the arrival of this train at the Sevilla Santa Justa station is at 14:02 h. The duration of the journey from Barcelona Sants to Sevilla Santa Justa has been 5 horas 32 minutos. Regarding the saving in tickets for AVE Barcelona Seville, the perfect departure time is at 15:50 h, remember it when you book tickets for AVE Barcelona Seville, if this hour suits your travel, do not hesitate, in this way, you are going to arrive at 21:20 h. Break out of the routine and a make the trip you want, with the best prices on train tickets Barcelona - Seville. If we add, to the departure time at 15:50 h, booking tickets for AVE Barcelona - Seville in Turista class and with the AVE tickets Barcelona Seville from ida, we will ensure that the cost of our tickets for AVE Barcelona - Seville is of only 35,35 €, which is the cheapest price we can offer for your tickets AVE for this journey. Travel by AVE from Barcelona to Seville without having to check in the luggage, without having to be there for hours before getting on the AVE, travelling by AVE means travelling without waiting. In turn, we can guarantee that the maximum you are going to pay on Trenes.com for your tickets AVE Barcelona Seville is of 198,50 €, we will get this price if we depart at 8:30 h, book tickets for AVE Barcelona - Seville from ida and travel in Preferente class. AVE tickets from Barcelona to Seville for an amount of 198,50 € carry out the route in 5 hours 32 minutes. If you are looking for a cheap trip Barcelona - Seville, but without skimping on the quality, buy your tickets AVE Barcelona Seville. On the other hand, as you will only pay 35,35 €, the time of travel is of 5 hours 30 minutes. Don't call off your trip just because you havenât found yet the best and cheapest way to travel from Barcelona to Seville and discover our tickets AVE Barcelona Seville. Joining Barcelona and Sevilla by AVE has been a wise decision, linking two fantastic cities in about 5 hours and 35 minutes. Do not forget that between Barcelona and Seville there is a distance of 829 km. Before 2009, it was possible to travel to Andalusia with the AVE but it was necessary to pass through the capital of Spain, Madrid. With this trajectory, the journey lasted approximately six hours and thirty minutes. Since 2009, a direct line was created that would connect Barcelona with Seville. A diversion in Madrid was created that would allow to avoid the station of Atocha and would save 50 minutes of travel. The construction that allows this deviation has been called "by-pass". If we continue with the comparisons, before the AVE, it took eight hours and twenty minutes to travel to Seville from Barcelona by train. Railway progress is totally visible! The station of Sevilla - Santa Justa is the third station with more inflow of passengers in Spain. The station has 13 routes and 6 of them with international width, especially for the AVE and Alvia. The remaining tracks are of Iberian width to allow the circulation of trains of Long Distance, Medium Distance and Cercanías. The inauguration of the station was on the second of May of 1991 at the same time that replaced two old stations, the one of Seville Plaza de Armas and the one of Seville San Bernardo. The first journey of the AVE was this between Santa Justa and Madrid Atocha. The main reason for opening the AVE lines imminently was the Seville Universal Exhibition in 1992, popularly known as "Expo'92". This exhibition lasted 6 months and celebrated the 500 years since the discovery of America. This exhibition was really important to the city and thanks to the AVE, it still got more visits. The mascot of this event was Curro.